One of the defining moments in the direction of my musical career happened, of all places, in Portugal. It was the first time I encountered fado performed live in a cafe in Lisbon in the late ’90s. Sipping port in a smoky room, I found myself completely transfixed by this strange but familiar music. I loved everything about the performance – the Portuguese guitars, the virtuosity and the pained look of the female singer dressed in all black, like she was mourning. I had no idea what she was suffering from but whatever it was, it was a compelling expression of it. I found myself inspired. It reminded me of kundiman, the traditional Philippine art song of yearning and unrequited love. Although fado and kundiman are different in style, they both are singing about passionate longings – the Portuguese for their loved ones who perished in the sea during a voyage, and the Filipinos about their unrequited love, who were very poor and had nothing to offer except their undying devotion. Now, I don’t consider myself an extensive kundiman practitioner (I only play some of them in my recordings arranged for solo guitar). I am more interested in attempting to get Filipinos to appreciate and respect it today much in the same way the Portuguese love their fado and who are very proud of it. Both the Portuguese fado and Filipino kundiman are traditional art songs that demand very high level of skills and musicianship. And both art forms are tied to their national identities. 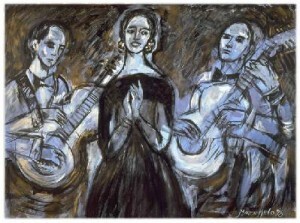 Yet fado is known around the world and its practitioners have evolved which resulted not only in the preservation of a traditional art form but a thriving modern iteration, while kundiman is largely forgotten and remains a relic of the past, with no presence at all in the mainstream media, not even in the Philippines. As to why that is, or if you disagree, feel free to offer your thoughts in the Comments section below. One thing for sure, it has to start at the local level. The world music market is not going to suddenly pick up on it if there is no thriving scene and widespread movement in the mother land. Local artists have to lead the way in practicing, respecting, popularizing and redefining the genre. Fado intrigued me because even though these songs are centuries old, it evolved into something that is very much alive today, music that a modern singer would choose to perform or a contemporary composer writing it. It is also a medium that measures the greatness of an artist. The great Amalia Rodrigues comes to mind. Fado practitioners are also unafraid to modify it to suit their modern taste, to push the boundary or to create something loosely based on it. Now this idea of iterating a traditional art form into something new intrigued me. I had this grand idea of doing that to the kundiman, and to other Philippine art forms like harana, for that matter. In fact, all my recordings reflect this – they are not exactly your grandma’s kundiman and harana. My most ambitious attempt is writing Lalawigan – A Tagalog Song Cycle. Among the twelve-song collection, I wrote a modern harana, an inverted kundiman, a take on the virtuosity of kutyapi players, and used archaic Tagalog. All with a very modern sound (see video below). Successful or not, I love that I can do this. It is a creative framework that resonates, inspires and is meaningful to me. Best of all, it is a chance to arrive at a new iteration. “I traveled the world in search of my muse only to find her waiting at home”. (2:08 – 2:52) Harana ni Isagani is a modern harana composition. This footage only includes the instrumental section but you can hear the harana rhythm behind contemporary harmonies. (3:53 – 4:56) Didang is a song that attempts to push the boundary of what a kundiman can be. The tempo is free-flowing with harmonies not usually utilized in kundiman. The dramatic element is amped up. Although it is still a love song, it is a longing that peers into the darkness of a human soul. This entry was posted in Featured Articles, Kundiman. Bookmark the permalink. You dont seem to be aware of Ms. Charmaine Clamor who siginging has made our kundiman heard all over American on the radio. Charmaine is on the David Byrne album with Cyndi Lauper and I tihnk that is mainsteam! All her albums have kundiman and she sings them at her concerts. It is sad that a good guitarista like you do not know her work and celebrate it. Charmaine also sings harana so beautiful btw! I know Charmaine! She is a colleague of mine and we performed together a couple of times in the Bay Area. My apologies to those who are doing their part but are not mentioned. It does take a community to pull it off and I am advocating for widespread respect and a thriving scene from the motherland where they hold the key to a treasure trove of beautiful music. The more the merrier! I became a Fado Enthusiast just last year, August 2011. I started listening to French Pop through buying CDs abroad by known Francophone artists such as Celine DIon, Lara Fabian, Isabell Boulay, etc. But before that, I used to listen to Spanish Pop with the likes of Edith Marquez, Jaci Velasquez & Ednita Nazario. And yes, I agree, I ahve loved the song “Matud Nila” when I was a kid. Then browsing through the amazon pages looking for a new addition to refresh my music library, i happened to stumble into the CD entitled “Ulisses” by Cristina Branco. I said to myself, this is Portuguese, what the heck, took out samples, and started playing it in my iPOD. As being a music lover and naturally accustomed to modern pop, I have not appreciated first the plucky gutars, expressive singing but the crystalline voice of Cristina Branco really got into me. I played it the second time and then all of a sudden, I found myself listening to this wonderful album, over and over. It was like I was taken back to when my love for music started when I bought my very first cassette tape of Mariah Carey’s Daydream back in ’95. The idea is to have Branco to lineup as one of my favorite artist of all time but i never got contented as the beauty of the Portuguese language, emotional interpretation of Branco, beautiful rhythm and the heart wrenching plucky guitars of Custodio Castelo led me to research and discover Fado. At the moment, a day without fado for me is like a year without rain. Never mind if I don’t speak Portuguese but the Saudade that you will feel from the music will get into you. (I am considering other musical genres at the moment the least of my priorities) I am very glad that I became introduced (and well, acquainted) o wonderful Portuguese Fado musicians such as Mafalda Arnauth, Mariza, Joana Amendoeira, Luis Guerreiro, Ana Moura, Ana Lains, Helena Sarmento, Custodio Castelo, Aldina Duarte, Katia Guerreiro, Antonio Zambujo, etc. Wow, I thought being the weird 29 year old guy that I am, I am the only Filipino who has the ability to appreciate Fado. I look forward to listening to your work, Mr. Florante and like you, I also have the passion to be taken back to my cultural roots.